There is perhaps no better space saver in a bedroom than a bunk bed. That is, of course, until you add a trundle bed underneath and instantly, you have room for 3. We researched some of the best-selling and highly rated products to put together this bunk bed buying guide to help you find the right one for your kids. Before we get into our products, let’s take a look at some of the key features you need to know. Material: Most of these bunk beds are made of wood. Some are completely wood while other use wood as well as particle board or MDF. if you want something to last years and year, wood is your best bet. Access: There are 2 ways to get to the top bunk: a ladder and stairs. Ladders don’t take up as much room and are a little more convenient. That said, stairs are really safe choice for younger kids and usually pack some storage space. Size: A lot of these bunks are twin-over-twin but there are a handful of twin-over-full designs, too. Twin-over-full obviously gives you a little more sleeping space. Just remember, the trundle for all of these beds is always a twin. Finish: Finishes vary just a bit. Some of these products come in one color, some in 3 or 4. Generally, you’ll find natural wood grains, espresso, cappuccino, and white finishes so you can match the rest of the decor in your room. Dimensions: Make sure you know how much space you have before you choose. And keep this in mind, you have to leave room for the trundle to be pulled out so you’re essentially doubling the length and width. Warranty: Warranties really vary a lot with these products. Some offer no warranty at all while others give you 1 year of coverage. As always, read the fine print carefully so you know what’s covered and what isn’t. 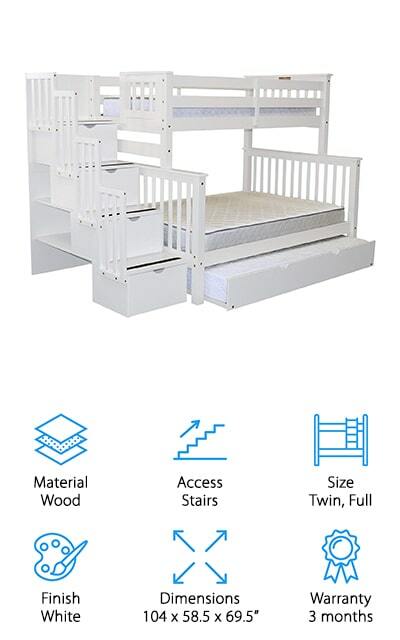 Now that you know a little more about what to look for, let’s move right into our bunk bed reviews. We put our top and budget picks right at the top of the list so they’re easy to find. That way, even if you’re in a hurry, you can get some idea of the range of options that are available. Keep reading if you can, we found a lot of great stuff. Ready to get started? Let’s go! Our top pick for the best bunk bed with trundle is from Bedz King. This is an awesome bunk that features a twin over full bunk with a twin size trundle underneath. 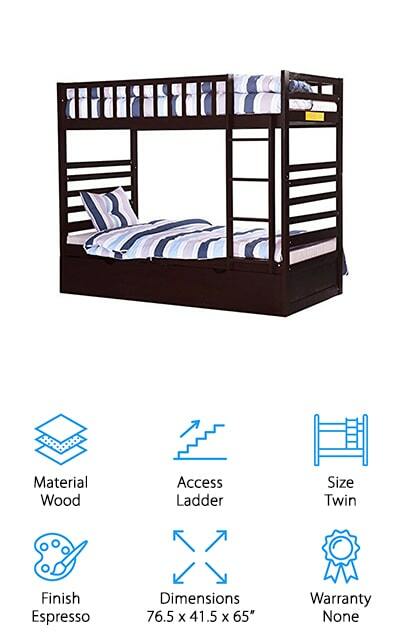 This bed features a stairway instead of a ladder which makes it safer for your kids to get up to the top bunk. That’s not all, there’s built-in storage, too. Each step has a front facing drawer in it and there are 3 shelves underneath the stairs that are accessed from the side. This bed is made of solid Brazilian pine with no MDF or particle board which means it’s really sturdy and safe. One more thing, it can also be converted into a twin and a full bed if needed. 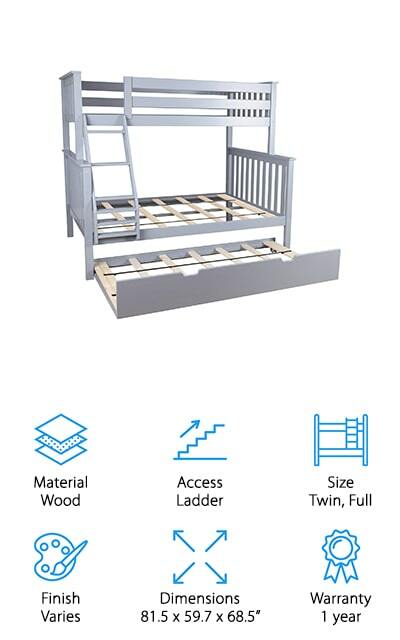 For a twin-over-twin bunk bed with a trundle that isn’t going to break the bank, check out our budget pick from Merax. This bunk is made of solid wood that’s been sanded smooth and given a beautiful deep chestnut finish. It’s durable and strong and makes a great addition to a kids room or guest room. This bed has pretty simple, straightforward design that’s compact with clean lines. It’s a great choice for small spaces because it won’t take up too much room and it matches just about any style decor. There’s a simple ladder attached to the side for easy access to the top bunk. As for the trundle, it’s equipped with caster wheels so it’s easy to pull out and put it away in the morning. This bed from Discovery World Furniture is a great option for a trundle bunk bed. The entire bunk is made of wood which means it’s really sturdy and durable. This is a twin over full design with a twin-size trundle. There’s a 4-rung ladder that leads up to the top bunk. It’s slanted slightly so it’s a little safer to climb. The ladder is also reversible so you can move it from the right or left side of the bed. The top bunk has a guard rail in the center for additional safety. Slat kits are included for all 3 beds, too, as these beds are not compatible with a box spring. These beds can also separate into a twin and a full when your kids outgrow their bunks. Next up is this awesome bed from Max & Lily. It’s made of solid, knot-free New Zealand pine that’s exceptionally durable with a non-toxic protective finish. It’s actually available in a few different colors: natural, grey, white, and espresso so you’ll be able to find one that matches your kids’ room without a problem. Each bed can hold up to 400 pounds. That’s a lot of weight for a bunk bed and makes this one of the few that can safely hold an adult on the top bunk. That also means that this bed can grow with your kids, even through the teenage years. 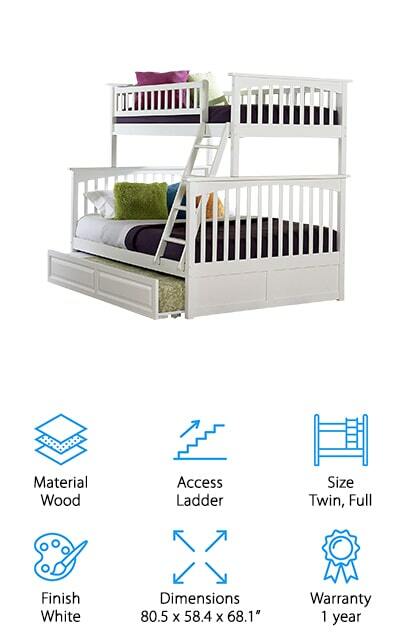 One more thing, the ladder to the top bunk is reversible and can be attached to either the left or right side. 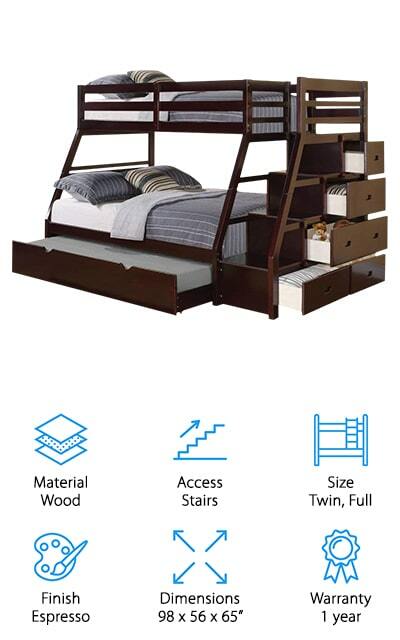 Another great wood twin bunk bed is the Atlantic Furniture Columbia Bunk Bed. Believe it or not, it actually exceeds industrial safety standards. 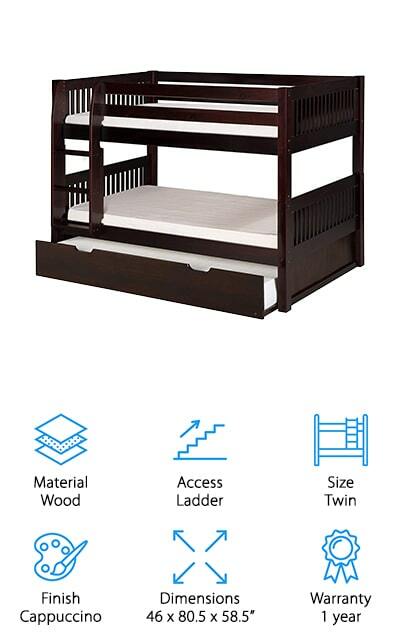 This bunk is made from eco-friendly hardwood. It’s sturdy, durable, and has been treated with a protective 5-step finish. It’s available in natural maple, or antique walnut to match any bedroom style. 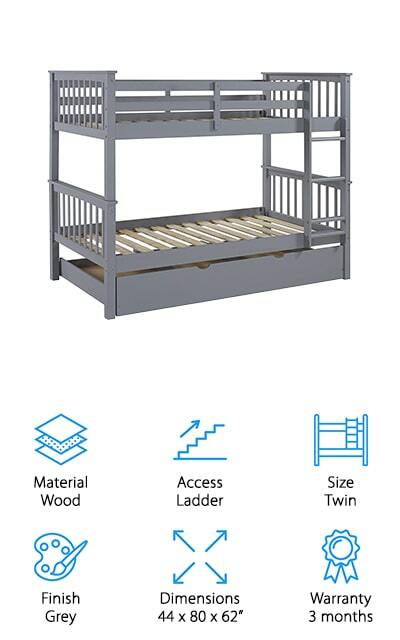 This bunk includes a slat system for each bed and can accommodate a mattress up to 9 ½ inches thick. The twin over full design is great for sleepover guests and makes a really nice addition to any guest room. The ladder is reversible and can be installed on either end of this bed. That’s not all, you can even convert it into 2 separate beds if you need to. 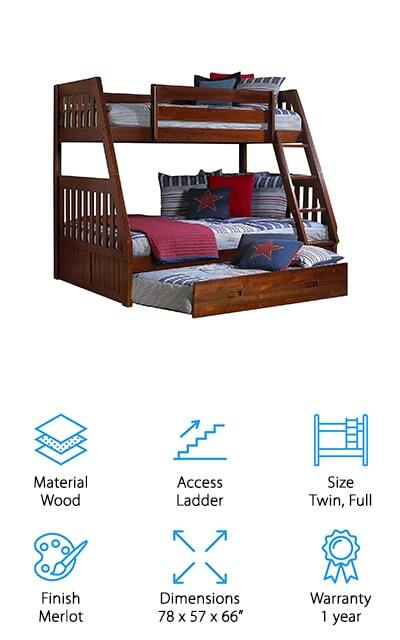 The Bedz King Mission Bunk Bed is our next pick for double bunk bed. The twin over twin design had a twin trundle on the bottom so it can sleep 3 when it’s time for a sleepover or if family is coming to stay. 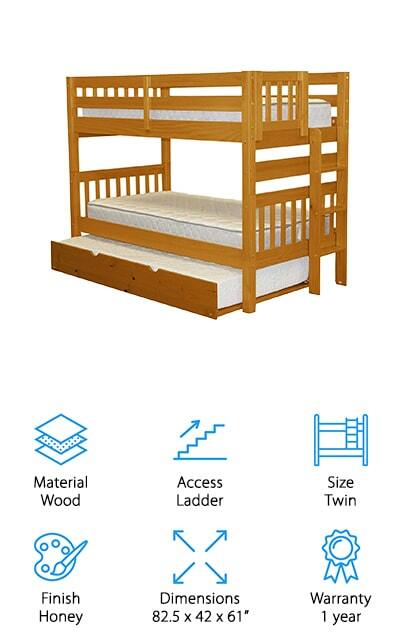 The top bunk is accessed from a ladder placed at the foot of the bed. It can be installed on the right or left-hand side. The whole frame is made of solid Brazilian pine and doesn’t use any MDF or particle board which makes it extremely durable. You can separate this bunk into 2 separate beds when the time comes, too. You also don’t need to worry about getting a bunkie board because all the mattress support slats you need are included. Assembly is required and the tools are included. Another great option is the Richland Bunk Bed from Atlantic Furniture. It’s a twin-over-twin that’s made completely out of eco-friendly hardwood and covered with a protective five step finish. The bright white color matches any room while adding a pop of brightness. While some of the other bunks on our list are a little plain or boxy, this bunk has gorgeous curved soft arches that add a bit of elegance to the design. There’s a simple 4-step ladder to access the top bunk that you can mount on either end. The trundle fits perfectly under the bottom bunk and has 4 smooth rolling casters so it’s easy to move in and out when you need to. Plus, the mattress support straps are included for all 3 beds, too. If you’re looking for a bunk bed with storage, you’re in luck. Our next pick is the ACME Jason Bunk Bed and it actually has enough storage that it can be used as a dresser, too. Why do we say that? The top bunk is accessed using a set of stairs. At the foot of the bed, there are 4 drawers that are built into the staircase that gives you room to put extra pillows, blankets, or clean clothes. This bed is made of pine with MDF and comes in a beautiful, deep brown espresso finish. There’s a white version available, too. This is a twin-over-full design that provides a lot of sleeping space for sleepover guests. It takes a 7-inch mattress and all of the support slats are included. Last but not least is this bunk bed from WE Furniture. It’s a pretty simple design that features identical slatted head- and footboards for the top and bottom bunks. Of course, there’s a trundle that slides perfectly under the bottom bunk using smooth-rolling casters. This bunk is made of solid wood and has a beautiful painted gray finish that’s neutral without being boring. It will fit with the decor of any room. Access to the top bunk is with a simple ladder that’s attached to the side. There’s also a guard rail for added safety. These bunks can be easily separated into 2 twin beds, and here’s the kicker. 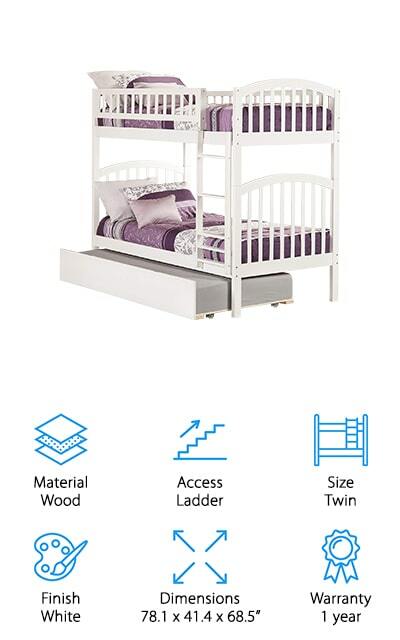 Unlike some other bunks that have visible openings for ladders or mismatched headboards, the twin beds are completely identical when separated.